H-151 is a potent, irreversible and selective small molecule inhibitor of STING , a key sensor of cytosolic nucleic acids. STING is a transmembrane protein found in the endoplasmic reticulum. Upon activation, it functions as a signaling hub, orchestrating immune responses to pathogenic, tumoral, or self-DNA detected in the cytoplasm . H-151 exerts its inhibitory action by covalently binding to STING at the transmembrane cysteine residue at position 91. This synthetic indole-derivative blocks STING palmitoylation and clustering, two essential steps for STING signaling. In models of autoinflammatory disease, H-151 blocks STING‑induced expression of pro-inflammatory cytokines and reduces inflammation . 1. Haag S.M. et al., 2018. Targeting STING with covalent small-molecule inhibitors. Nature 559:269-73. 2. Ishikawa H. & Barber G.N. 2008. STING is an endoplasmic reticulum adaptor that facilitates innate immune signalling. Nature 455:674-8. Effect of H-151 on the IRF response of THP1-Dual™ cells to 2’3’-cGAMP. THP1-Dual™ cells were incubated with 20 µg/ml of 2’3’-cGAMP and increasing concentrations of H-151. After overnight incubation, the IRF response was assessed by determining Lucia luciferase activity in the supernatant using QUANTI-Luc™. Data are shown as percentages of the maximum response. H-151 specifically inhibits STING activity. : THP1-Dual™ cells and B: RAW-Lucia™ ISG cells were incubated with 20 µg/ml of 2’3’-cGAMP, 7.5 µg/ml of 3’3’-cGAMP Fluorinated, 7.5 µg/ml of 2’3’-c-di-AM(PS)2 (Rp,Rp) or 1 µg/ml of 3p-hpRNA/LyoVec™, in the presence or absence of H-151 at 130 ng/ml (0.47 µM) which corresponds to its IC50. 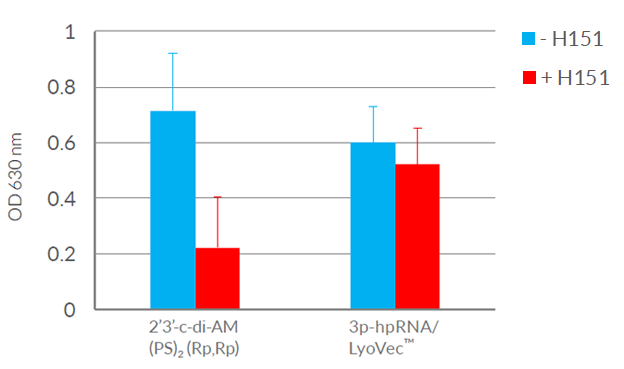 The RIG-I ligand 3p-hpRNA was delivered into the cytoplasm using cationic lipid transfection reagent, LyoVec™. After overnight incubation, the IRF response was assessed by determining Lucia luciferase activity in the supernatant using the detection reagent QUANTI-Luc™. Data are shown as percentages of the maximum response. 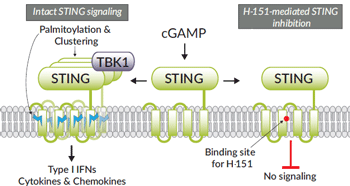 H-151 inhibits activity of multiple human STING variants. THP1-Dual™ and THP1-Dual™ KI-STING cells were incubated in the presence or absence of 400 ng/ml of H-151. THP1-Dual™ and THP1-Dual™ KI-STING-R232 cells were further incubated with 7.5 µg/ml of 3’3’-cGAMP Fluorinated while THP1-Dual™ KI-STING-S154 and THP1-Dual™ KI-STING-M155 cells were not incubated with a STING ligand as they constitutively express activated STING. After overnight incubation, the IRF response was assessed by monitoring Lucia luciferase activity using the detection reagent QUANTI-Luc™. Data are shown as percentages of the maximum response. Effect of H-151 on the NF-κB response of THP1-Dual™ cells to 2’3’-c-di-AM(PS)2 (Rp,Rp). THP1-Dual™ cells were incubated with 7.5 µg/ml of 2’3’-c-di-AM(PS)2 (Rp,Rp) or 1 µg/ml of 3p-hpRNA/LyoVec™, in the presence or absence of H-151 at 130 ng/ml (0.47 µM) which corresponds to its IC50. The RIG-I ligand 3p-hpRNA was delivered into the cytoplasm using cationic lipid transfection reagent, LyoVec™. After a 24h incubation, NF-kB activation was determined using QUANTI-Blue™, a SEAP detection reagent, and by reading the optical density (OD) at 630 nm. H-151 is shipped at room temperature. Upon receipt, store at -20 °C. Resuspended H-151 is stable for at least 3 months when properly stored.